The Equestrian Center at The Club at Las Campanas is a comprehensive, professionally staffed and managed boarding, training and showing facility that caters to a wide variety of riding disciplines. 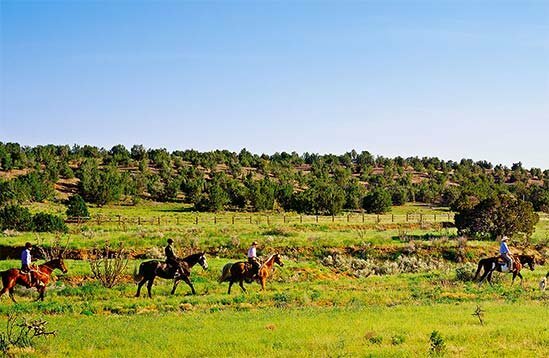 Las Campanas serves members and their guests by providing the finest of care and comfort for their horses. Best of all, this extraordinary center is located right where you live with thousands of adjacent acres of riding opportunity over some of the most spectacular country in America. If you live to ride, the trail starts here! The Equestrian Center at Las Campanas is comprised of a number of Morton Buildings and custom designed structures that include a 14,000 square foot Boarding and Training Barn with 28 stalls; a 30,000 square foot Indoor Riding Hall; a 140′ x 280′ Outdoor Show Arena; a regulation-size Dressage Ring; a round pen; turn-out paddocks, trail horse stables and a spacious hay barn. Both English and Western riders (and their horses) will feel right at home here. Whether you prefer the indoor arena to the open range, or graceful jumping to barrel racing – you will find others of like mind and interest. The Equestrian Center is located in Arroyo Calabasas off Ranch Estates Road. This approximately 1 mile south of The Spa. From The Spa turn left onto Clubhouse Drive, right onto Camino La Tierra and then the next left onto Ranch Estates Road.